4740(S): A user account was locked out. Security ID [Type = SID]: SID of account that performed the lockout operation. Event Viewer automatically tries to resolve SIDs and show the account name. If the SID cannot be resolved, you will see the source data in the event. Account Name [Type = UnicodeString]: the name of the account that performed the lockout operation. Security ID [Type = SID]: SID of account that was locked out. 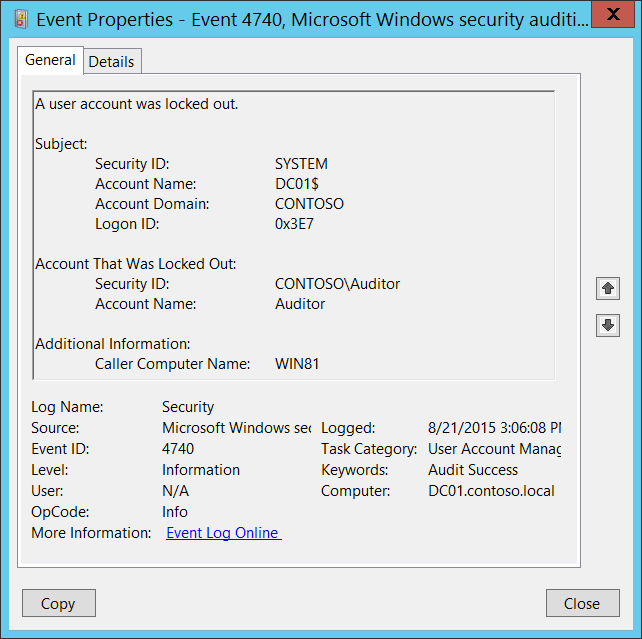 Event Viewer automatically tries to resolve SIDs and show the account name. If the SID cannot be resolved, you will see the source data in the event. Account Name [Type = UnicodeString]: the name of the account that was locked out. Caller Computer Name [Type = UnicodeString]: the name of computer account from which logon attempt was received and after which target account was locked out. For example: WIN81. For 4740(S): A user account was locked out. Because this event is typically triggered by the SYSTEM account, we recommend that you report it whenever “Subject\Security ID” is not SYSTEM. If you have high-value domain or local accounts (for example, domain administrator accounts) for which you need to monitor every lockout, monitor all 4740 events with the “Account That Was Locked Out \Security ID” values that correspond to the accounts. If you have a high-value domain or local account for which you need to monitor every change, monitor all 4740 events with the “Account That Was Locked Out \Security ID” that corresponds to the account. If the user account “Account That Was Locked Out\Security ID” should not be used (for authentication attempts) from the Additional Information\Caller Computer Name, then trigger an alert. Monitor for all 4740 events where Additional Information\Caller Computer Name is not from your domain. However, be aware that even if the computer is not in your domain you will get the computer name instead of an IP address in the 4740 event.